Coffee is how most people in the United States (and throughout much of the rest of the world) start their day. It helps people overcome the grogginess of waking up in the morning and keeps them productive throughout the day. Nowadays, it’s a regular enough part of life that it’s expected to be offered from office break rooms to anywhere breakfast is served. Coffee makers are also one of the most common appliances found in homes today. 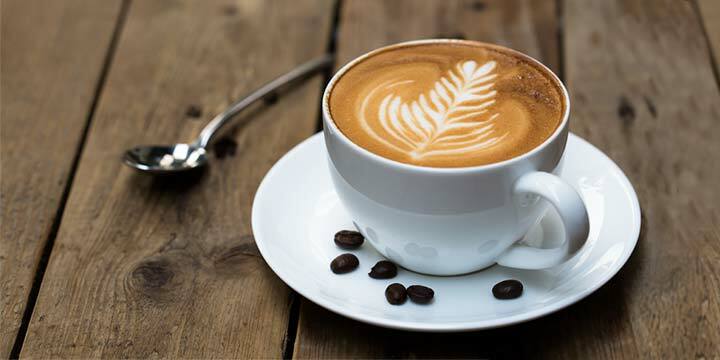 From the devoted coffee lovers to those who simply turn to it for the occasional pick-me-up, few people need to be convinced of the benefits of owning their own coffee maker. But with coffee shops a familiar sight in most cities, not everyone considers the benefits of making their own at home. Savings vary based on how you like your coffee, but if you drink at least one cup of coffee every day you’re probably saving $2-$3 a day making your own. Over a year, that’s around $1,000. You’ll save both gas and time by skipping that trip to the coffee shop. You can make pretty much whatever type of coffee you like best at home (and have some options you won’t find at your usual coffee shop). That coffee smell you like so much will fill your kitchen every morning. If anything, making your own coffee at home gives you more room to be picky about choosing the type of coffee you like best and crafting the perfect cup to your tastes every time you brew a pot. And no matter how you cut it, as long as you use your coffee maker rather than falling back on the familiar habit of buying coffee by the cup at your local Starbucks, you will save money in the equation. The type of coffee maker you buy can make a big difference in your the overall experience. There are plenty of options available to you, and there’s no clear consensus on which type is best, it’s all a matter of taste and what works best for your situation and budget. Let’s take a closer look at the different types of coffee makers. Are You Drinking the Best Coffee? The coffee brewer, sometimes called an automatic drip coffee maker, is easily the most common type of coffee maker you will find in homes across the world. This type of coffee maker can come in a number of shapes and sizes, but when you hear someone talk about making a pot of coffee (e.g. several cups at once), they’re usually going to be using a coffee brewer. These familiar machines are very easy to use. You load up a coffee filter with your choice of ground coffee, put it in the allotted spot, add water, and start the coffee maker. For some drip coffee makers, this process is even easier than that. You can make the coffee as strong as you prefer and return to the pot for refills until it’s done (or no longer fresh enough to meet your tasting standards). These drip coffee makers aren’t just common in homes, they’re also the type you’ll see the most often in office break rooms and many types of restaurants. This type of coffee maker is not only affordable to buy, it’s also affordable to use. Filters are cheap to buy and will last for a long time. And ground coffee both come pretty cheap (unless you choose to splurge on more high-end brands of the latter). You can also buy bags of whole bean coffee and use a coffee grinder to grind it yourself. Affordable to buy and use on a daily basis. Very convenient, as it makes a whole pot of coffee at once. Lots of options for different models, shapes, sizes and brands. Offers easy flexibility in brewing the best-tasting coffee for your taste buds. Only makes basic coffee. Nothing fancy, and likely won’t be satisfactory for those that prefer espresso drinks. Makes a lot at once. While a benefit, there may be instances where you end up wasting a lot of coffee. One of the newest types of coffee makers on the market, single-serving coffee makers are sometimes referred too as pod coffeemakers because that’s what you use to make the coffee – single-serving pods or K-cups. You can buy pods in all sorts of different flavors that are tailored to meet your personal preferences, and then simply drop them into the machine, add water, and brew. Automatic drip coffee makers were already convenient and easy to use, but single-serving models are even more so. You don’t have to worry about messy coffee grounds or filters, so you skip a couple of the steps common to making coffee in a more traditional brewer. There’s also less clean-up as the pod gives you coffee, but the grains stay contained within. While the over all cost will range based on features and brands, single-serving coffee makers tend to be affordable to buy, but can be more expensive to use over time. The pods you use with this type of machine tend to be more expensive than simply buying a bag of coffee beans or ground coffee. Don’t let this stop you though, as some single-serve models have extra add-ons that allow you skip the individual pods and load your own coffee grounds. While this will help offset the long-term costs, it may potentially create more of a mess that you’ll need to clean up daily. Extremely easy to use and clean. This type of coffee maker is usually very affordable. Coffee pods come in many flavors. Less waste of coffee if you only want to drink one cup at a time. Great for offices, as coworkers can brew coffee precisely to their taste. Will also brew tea, if you buy the right pods. Buying individual pods will get expensive over time. Not great for the environment, because constant use and disposal of K-cups will produce a lot of plastic trash over time. One of the most traditional methods for making coffee, the French press is decidedly low-tech, but still simple to use. You simply pour in the amount of coffee grounds you want, add boiling water, and press the lid of the device down to force the grounds to the bottom. A French press is one of the cheapest types of coffee makers available for you to make your own coffee at home. Not only can skip buying filters, but it uses absolutely no electricity. And depending on the size and brand you buy, the device itself can cost as little as $10. The coffee produced by the French press isn’t always as flavorful as that of some of the other options, especially if you don’t let it brew for just the right amount of time. And you’re more likely to get some loose grounds floating in your cup. So, while for the frugal it’s an obvious choice, for those at all particular about the quality of their morning cup of joe, it might not make the best option. This type of coffee maker is the most affordable option. Very little costs once the device is bought. No filters or electricity required. You may end up with more grounds floating around in your coffee. You have to get the timing just right for the flavor to be how you want it. Espresso makers are the “sports cars” of the coffee maker world. If you’re a serious coffee aficionado, espresso is probably your favored type. While it will widely-range based on brand and features, espresso makers almost always fall on the higher end of the price range, but for those who really value their daily cup of joe, the difference is absolutely worth it. Espresso makers usually produce smaller quantities (think a shot versus a cup) that are stronger and more flavorful. However, any decent espresso machine out there will allow you to make a variety of drinks, such as cappuccinos, macchiattos and lattes. The most common models will allow you to make just one shot of espresso at a time, but it’s becoming more common to make two shots of espresso at once. To make your buying decision even more complex, there are a wide variety of features, brands and types of espresso machines available for you to choose from. If you feel that an espresso machine is the best coffee maker for your home, we’d encourage you to read our buyer’s guide before making your purchase. Espresso machines create the highest quality of coffee, according to most enthusiasts. Offers you the ability to make the types of drinks you often see at coffee shops, like cappuccinos, lattes, mochas and macchiatos. An attractive kitchen appliance to have on your countertops. Usually, this will be the most expensive coffee maker on the market. Makes small quantities at a time, only a shot versus an entire cup or pot. 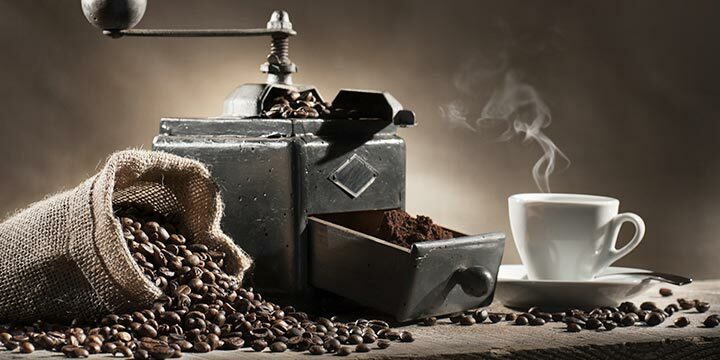 Figuring out the type of coffee maker to buy and what features to look for is pretty straightforward if you have an idea of what you want in your daily dose of morning coffee. 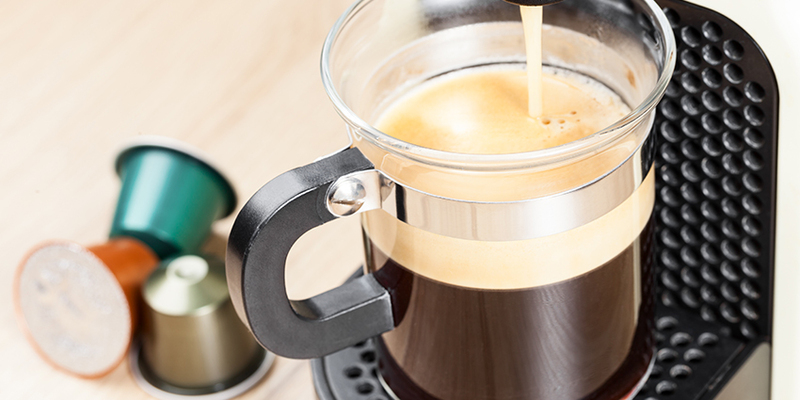 Whether or not you know the type you want to buy, here are a few factors you should consider when shopping for a coffee maker. 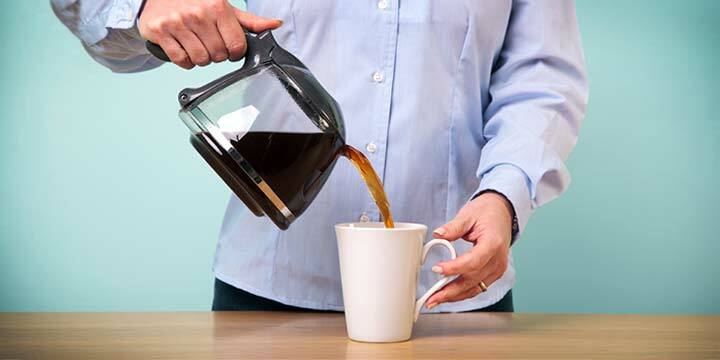 How many people in your household drink coffee and how much will they drink on average? If buying a single-serve coffee maker will mean having to go through the process of making a cup five times before you all get out the door in the morning, the convenience the model was made for pretty much goes out the window for you. However, if you’re the only one in your house that drinks coffee, and you only want one cup to help wake you up, then perhaps a single-serve coffee maker is the right choice for you. In some situations, being able to make a pot of coffee that produces 4-10 cups is much more convenient than dealing with making just one cup or shot of espresso one-at-a-time. So, think about who all in your household will be drinking coffee and how much they will likely drink. Again, K-cup pods can get expensive if you drink a lot of coffee, so take this into consideration before buying. 2. How Do You Like Your Coffee? This is really one of the most important considerations you have in front of you. What do you usually order when you go to the coffee shop? If you exclusively stick with cappuccinos or lattes and try to save money by buying a coffee brewer, will you even use it? And if you do, will you enjoy the coffee you make? You should only buy a coffee maker that produces the type of coffee you actually enjoy, or what’s the point? Of course, if the coffee you like the most requires spending several hundred dollars on an espresso machine and you don’t have that kind of money, you may need to make some compromises. Or just look for a unit that is within your budget, but lacking a few of the bells and whistles the more expensive models have. No matter what you decide, be sure you consider both the upfront and long-term costs of whatever type of coffee maker you choose to buy. It may be worth spending a little more today if it will save you money over the next few months or years – or if it means you actually use the coffee maker you buy. The bottom-line here is to not settle on something you don’t really want, otherwise you may find yourself back at the coffee shop every day. If you’re like most people and make most of your coffee in the morning, then you might want to avoid any coffee maker that’s complicated to use. Sticking a pod in and pressing a button might be the most you want to deal with a few minutes after waking up. You know your habits better than anyone. Will having to put a little more time into making your morning coffee become a deterrent to actually using the machine you buy? Consider when you usually wake up and how long you give yourself to get ready and factor that into the decision you make. Another consideration to think about, is buying a coffee maker that will automatically brew a pot of coffee at a specific time that you decide. There are dozens of models out there that are programmable to brew a pot and have it waiting for you when you roll out of bed. Of course, those same models may take a bigger bite out of your budget, but alas, it is something to consider. Every kitchen has a limit on how many appliances you can fit on the counter. Some coffee makers will take up much more space than others, so you have to weigh what you want against how much it’s worth giving up the countertop real estate. During the buying process, look at the dimensions of the coffee makers you are considering. Once you know this, you will have a better idea of where it will go and how much space it will take up. Keep in mind, if your coffee maker has to be put away in a cabinet or another room after every use, you might find yourself using it less and less as time goes on. Make sure you have necessary space for the model you want before you purchase it. If you’re not sure whether you have enough space, at least make yourself familiar with the return process of wherever you bought the unit from. This will help you avoid problems you never anticipated on having. Do you want to just set your coffee up to brew and leave it? As we previously mentioned, some coffee makers will let you determine the settings in advance based on what you like and automate it for future use. From the amount of coffee brewed to the time in which it gets brewed, programmable settings can come in handy for a wide variety of situations. Do you prefer your coffee grounds fresh? Depending on who you ask, freshly ground beans produce a better tasting cup of coffee. Having a grinder ensures you’re always using the freshest ground beans. Of course, you can always buy a coffee grinder separately, but having one that’s built into your coffee maker adds convenience and helps you save counter space. We’ve all experienced that early morning rush and forget something important while running out of the house. With the auto-shutoff feature, you can ensure that your coffee pot gets turned off and isn’t sitting there running all day long. This allows you to focus on what’s truly important for your day, all while you have a cup of joe in hand. For offices or commercial settings where making multiple pots at a time is often convenient, a coffee maker that has multiple warmers to keep each pot hot is worth considering. Some high-end coffee makers will come with a water filter to help ensure the flavor comes out just right. This is one of the more popular features that people consider when it comes to buying a coffee maker. If you like steamed milk in your coffee, this feature makes it easy to make the kind of drinks you can get in the coffee shop. For the most part, these will be found in most espresso machines nowadays, even those on the lower end of the price spectrum. However, if you only plan on drinking black coffee, you may not need this. One last consideration you should take into account when you’re shopping for coffee makers is the reputation of the brand. There are literally dozens of brands out there for you to choose from. However, you will find a few main brands that are dominating the coffee maker market. These brands not only stand above the others, but have a reputation for creating quality products. We dug into the consumer reviews for models made by each coffee maker brand to get a clearer idea of what customers think about their machines. Unlike some other brands on the list, coffee makers are this brand’s specialty, so they make all sorts. You’ll find a range of sizes, types, and prices in the models they sell. The Bunn coffee machines you’ll see the most will tend to fall under the category of familiar home coffee brewers, but they do also make some larger commercial models, single-serving ones, and espresso makers. The vast majority of the Bunn reviews we found online were positive. The brand appears to have a very strong reputation with consumers and people are consistently pleased with the flavor of their coffee across models. DeLonghi is a familiar name in kitchen appliances that makes a few models of drip coffee brewers and espresso machines. Reviews of their coffee makers are pretty mixed, but some models seem to get better responses than others (their espresso machines generally seem to score higher with customers than their coffee brewers). With such inconsistent performance, it’s best that potential customers give the reviews of any particular model they’re interested in a look before purchasing. Gaggia makes several models of affordable espresso machines. The reviews of their products lean toward the positive, with many comments on value for the money, but the occasional complaint of models needing minor fixes. If you’re interested in an affordable espresso machine, most reviews point toward this brand being worth the cost. Jura-Capresso makes a range of coffee makers from affordable coffee brewers to high-end espresso makers. Because there is such a wide range in their products, customers can likely find a model that fits within their budget and their preferences. 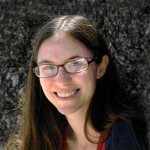 That wide range also means that customers might need to do a little extra research to determine the best model for them. Reviews of their products on the whole tend toward the positive, but there are a few complaints here and there that appear to be particular to certain models. Keurig is the best-known brand in the single-serving coffee maker space. They have a number of models for making coffee with pods. Based on the reviews we found, most customers seem to love their Keurigs. Their models are known for being easy-to-use and compact, so they don’t take up much kitchen or desk space. If convenience and affordability are priorities, their single-serve models may be a good choice for you. Krups is a popular brand in the market that mostly sells drip coffee brewers, but does have some espresso machines as well. Reviews of Krups models were pretty mixed – more on the positive side than the negative, but many from customers that started out loving their models and over time found their lack of durability unimpressive. Whether your tastes tend toward espresso drinks or you’re happy with a simple cup of black coffee, the right coffee maker is out there for you. Even if you go for one of the higher end models available, you stand to save money in comparison to all those trips to the closest coffee shop, so don’t let the upfront cost deter you. You may soon find yourself hooked on the particular flavors you work up in your own kitchen with no desire to go back to the drinks made by baristas. If you have any questions about buying a coffee maker, please leave them in the comments section below. Great article. I missed some info on the type of filters. I was considering buying a coffee maker with a metal one so to avoid all the paper waste but not quite sure what the best in terms of coffee quality would be. The brand Bunn is the most desirable coffee maker form me. I like most the Bunn GRB. My morning starts with this. Every. Day. What are the benefits of the cone shape filter and the flat bottom coffee machines?